US national debt surpasses $22 trillion, fiat is doomed, Bitcoin is not! The total national debt of the United States of America has just surpassed the horrifying amount of $22 trillion for the very first time in its history. The clock is ticking on the US dollar, as Bitcoin, with its fixed supply and anti-inflationary policy is waiting on the sidelines, ready 'to save the day'. According to Ben Brown, from CCN, the runaway mountain of debt is a terrifying reminder of how fragile the fiat monetary system in the US is. The US national debt apparently jumped $30 billion in the last month alone, adding to the more than $1 trillion worth of debt accumulated in the last year. Read more: What happens to Bitcoin if the stock market crashes? 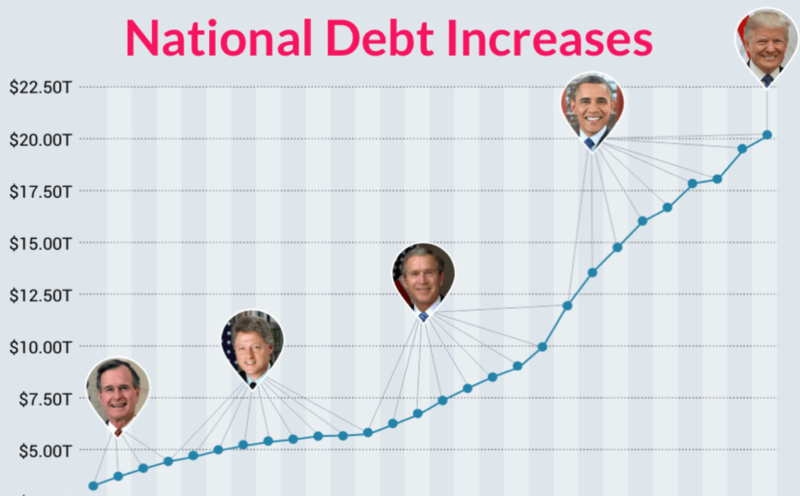 Ever since Donald Trump became president and introduced his $1.5 billion tax cut plan, the national debt has spiraled out of control. To be fair though, president Obama had the fall out of the 2008 financial crisis to deal with. Trump, on the other hand, was given an economy that was well on track. Of course the failing of the monetary system can not be attributed to one president alone. It is the system itself that is failing. The senior fellow at the Center on Budget and Policy Priorities, Jared Bernstein, explained to CNBC that it is unlikely that the US government is to take significant steps if the debt is as high as it is now. Most likely the US will struggle to pay back its debt and won't be able to support struggling institutions in the next economic crash, like they did in the wake of the 2008 crisis. One thing they will do, which they always do, is turn to the Federal Reserve to print more dollars. A familiar move that will eventually increase inflation and devaluate the purchasing power of all of our money. When the next global financial crisis occurs, and the world realizes organizations with $20 trillion in debt can't possibly ever pay it back, and thus must print it instead, and thus fiat is doomed... watch what happens to crypto. We can't possibly know what will happen to Bitcoin if we end up in the middle of an economic crisis, as Bitcoin was not even around during the last major one in 2008. We can expect, however, that when the next global financial crisis hits us, people will look towards Bitcoin as an alternative. As ShapeShift CEO Erik Vorhees predicted, the growing national debt will inevitably lead to a crypto boom.